History meets modern luxury at this boutique Philadelphia hotel, located within walking distance from major attractions, restaurants and international corporate headquarters. Located in Old City, this historic hotel is footsteps from Independence National Historical Park, the Liberty Bell, National Constitution Center, Penn's Landing, Museum of the American Revolution, the National Museum of American Jewish History and the PA Convention Center. Dozens of great restaurants, sidewalk cafes, boutique shops, galleries as well as live theater and performing arts centers surround this Philadelphia hotel. Sports enthusiasts are only a short subway ride away from Citizens Bank Park , home of the Phillies , Lincoln Financial Field , home to the Eagles, and the Wells Fargo Center, home of the Flyers and 76ers. Business travelers appreciate how convenient the hotel is to Dow Chemical, CHUBB , Wells Fargo Bank, USDA, the DoJ and NPS. Plus, more than 10 colleges & universities are nearby. 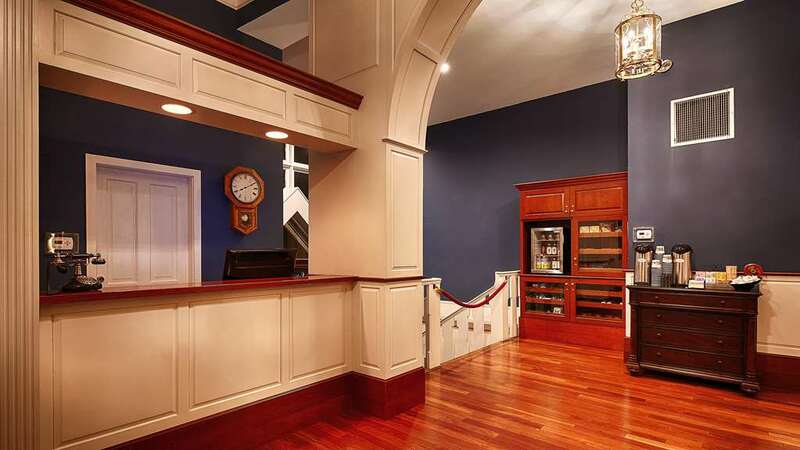 Included on the National Registry of Historic Places, the Best Western Plus is Philadelphias most historic hotel, featuring sweeping 17-foot-high ceilings, rich d cor and a beautiful glass-enclosed atrium. Hotel guests will delight in well-appointed guest rooms, complimentary Wi-Fi, complimentary hot breakfast buffet, afternoon tea and cookie service and a Wednesday night wine and cheese reception. Additional amenities include business services and meeting facilities. For guests arriving by car, preferred discounted parking with unlimited in/out privileges is available at the Ritz Public Parking Garage just around the corner from the hotel at a special rate of $18 USD per night when purchased through the hotel before overnight parking. (Price/Space subject to change). When you arrive, there is a convenient loading zone directly in front of the hotel. Please temporarily park in the hotel loading zone for check in and additional parking information.